In 1992, The Groutsmith was established in Sarasota, Florida. With a local brand showing signs of early success, Jonathan and his team got to work developing the business into the tile and grout leader it is today. Seizing the opportunity to improve upon the tile and grout products available at the time, our team began developing its own exclusive line of proprietary products that proved more effective than the leading professional-level cleaning and repair products on the market. After ten years of continual development and growth, we were confident we had perfected our products and found ourselves in position to expand the business by offering franchising opportunities to others who could introduce this specialized service to communities around the country. As the economy slipped into recession, however, Jonathan decided to put his plans of franchising on the back burner to avoid putting franchisees at risk of failure simply due to an economy that was too weak to support it. When economic conditions improved in 2010, we felt the time was right to reach out with a unique home services opportunity serving a steadily growing, high-demand market. Tile and grout wasn’t always the common building component it is today. Prior to the 1990s, materials like vinyl dominated the market, but as tile grew in popularity, consumers found themselves without specialists capable of cleaning, repairing, and restoring their grout when years of use left it worse for wear. Here at The Groutsmith, we found ourselves with a unique challenge ahead of us as we moved into new local markets: demand for a service few people knew existed. Up until then, when a bathroom or shower fell into disrepair, homeowners and businesses assumed the only option was to replace these surfaces completely or settle for the lackluster work of amateurs and handymen. But as more consumers saw the dramatic difference The Groutsmith’s powerful products made in their homes, it wasn’t long before friends, family, and neighbors reached out to get the same outstanding results themselves. Today, our franchisees take full control of their success using a business model that has proven itself effective in communities large and small across the country. Those who devote themselves to delivering quality service to customers in need have every opportunity to enjoy the benefits of a business that lets them work when and where they want while satisfying­––and many times exceeding––their financial expectations. If you’re ready to say goodbye to the stresses and demanding workloads many of us deal with every day, The Groutsmith offers a new path to a professional gratification many of our franchisees only dreamt of before moving forward with a business of their own. As the popularity of tile and grout continues to grow throughout the nation, the demand for this kind of specialized service grows with it. Here at The Groutsmith, we’re constantly developing and perfecting new processes and products designed to benefit our franchisees in new and exciting ways. 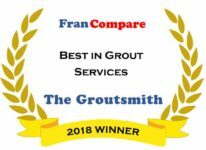 If you’re ready to be a part of The Groutsmith story, click here to learn more about our unique franchise opportunity today.